The fourth One Day International between England and West Indies at National Cricket Stadium, Grenada on 27th February entered the record books as the third-highest aggregate total in ODI history. In this match, bat did the talking right from word go. West Indies captain Jason Holder won the toss and decided to field first. Jonny Bairstow and Alex Hales gave the team a flying start as they added 100 runs for the opening wicket in just 13.5 overs. Jonny Bairstow scored 56 off 44 balls. Eoin Morgan and Jos Buttler added 204 runs for the 5th wicket. Jos Buttler registered his highest ODI score (150). England posted a mammoth total of 418 for 6 in 50 overs. 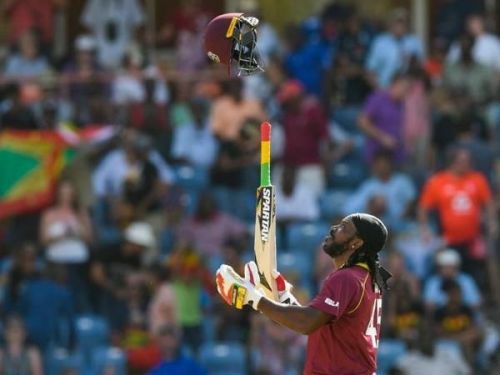 Chasing the target of 419 runs to win, Chris Gayle played a scintillating knock (162) and added 176 runs for the third wicket with Darren Bravo. West Indies then lost quick wickets but Ashley Nurse and Carlos Braithwaite revived West Indies hopes of winning by adding 88 runs for the 7th wicket. Rashid had the final say as he took four wickets in an over to help England win a high scoring thriller by 29 runs. During the 4th match, a total of 807 runs was scored for the loss of 16 wickets in 98 overs. A total of 46 sixes were hit during the match, breaking the record of 43 sixes which was hit in the ODI between India and Australia in 2013 at Bangalore. In one of the greatest ODI games between South Africa and Australia played at Johannesburg in 2006, a total of 872 runs were scored in 99.5 overs for the loss of 13 wickets. Australia posted 434 for 4 at the end of 50 overs but thanks to Gibbs' 175, South Africa chased down the impossible target with one wicket and one ball to spare. The second highest aggregate total in ODI was scored in the game between India and Sri Lanka at Rajkot in December 2009. A total of 825 runs were scored in 100 overs for the loss of 15 wickets. India posted a massive total of 414 for 7 in 50 overs. In reply, Sri Lanka were on course for a win but thanks to a brilliant bowling effort, India won a thrilling contest by just three runs. West Indies vs England 2019: Where does England's win in the 1st ODI rank among the highest ever ODI run chases?